The way the event goes, in the morn they have the 'kotai shinsa', which is basically where they check for confirmation. The whole trot around the ring, check teeth, coat, size, that sort of thing. In the afternoon the dogs are called back into the ring, lined up, and judged against each other. The best are sent to the middle first, and a long shuffle ensues with dogs and their handlers slowly being moved from one side of the ring to the middle, and then finally lined up in order on the other side of the ring. Placement in the final line up is temporary, with judges occasionally sizing up dogs, and switching their positions, or asking dogs to line up against each other. In the end, the judge signals that he's done, and everyone gets their ribbons. This goes on all day long in each of the 3 categories, juvenile/adolescent/adult (actually 6 categories since male/female are separated). There is also another category 'sogo yuryo' (overall champ basically) that is judged at the end of the day. To enter in this category a dog has to have placed higher than 3rd (I think it may have been recently changed to 2nd) in a previous exhibition. 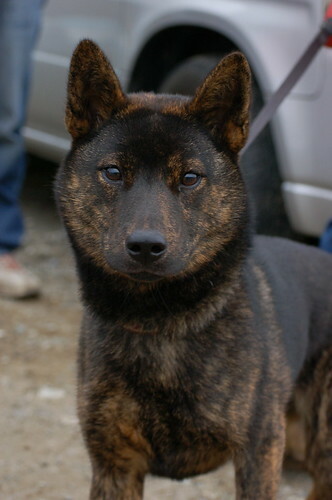 Haru's sire was entered in this category, as was another friend's female, Tsuki. As luck would have it, they both won their respective male/female categories and had to go up against each other. Riki won, making Haru's dad the number 1 Kai in the country. Congratulations to Inoue-san and his kennel. 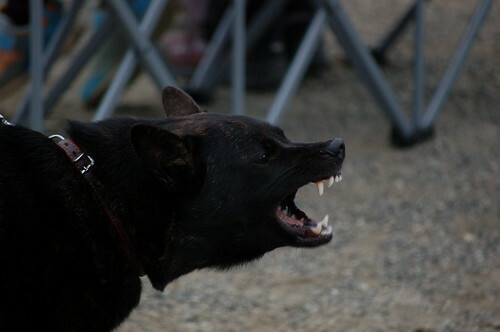 He took several other spots as well, including one for 2nd place in juvenile female that was won by Haru's kuro-tora half sister. It was a like a family reunion out there, and we would have tried to take a group photo with all the pups, but Riki is not really hot on hanging around lots of dogs. Two of Haru's half-sisters were there, another 2 month old litter also sired by Riki was there to go home with their new owners. Haru's half-sister 'Ikoro' (which means treasure in Ainu) is in a training program with Hokkaido University to track non-native raccoons. She's a very cute Kai, with excellent manners. Her owner (a student at Hokkaido Uni) is doing a great job with training her. While talking with everyone behind Inoue-san's car downing hot 'ton-jiru' (pork soup), and scarfing down maguro, we realized that most of the pups in Haru's litter, and the other litter with Ikoro in it, are now working dogs. I was later introduced to Dr.Yamashita at the exhibition. 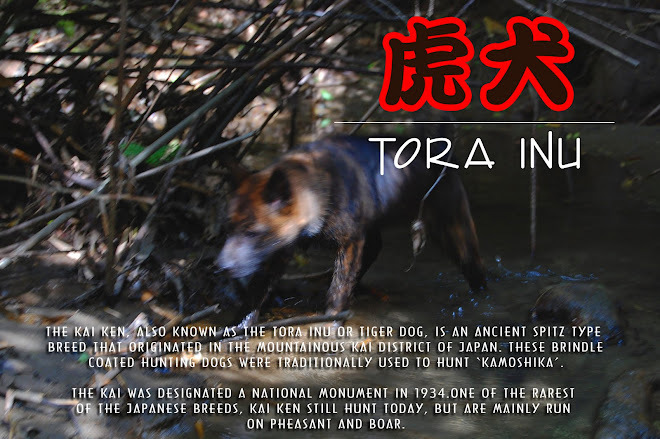 He's a veterinarian owns/trained the first Kai in SAR. He's helping train Ikoro at present, and I'd heard about him before when I was looking into SAR. 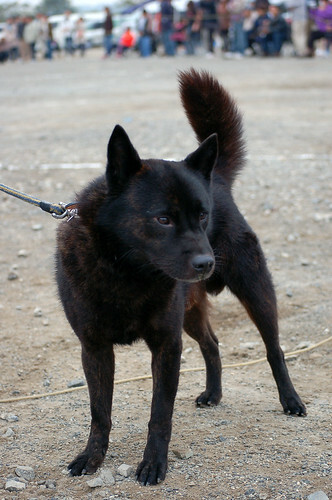 He also trains the KBD's (Karelian Bear Dog) that were imported from the US to work on bear in Nagano Prefecture. We had a great time talking about working dogs and 'primitive' spitz type dogs. I asked him about whether it was 'harder' to train a Kai to do SAR work. His answer was that perhaps for professional trainers who've trained a certain way their whole careers, it may be difficult to train a Nihon Ken. But by adjusting training methods, it's not at all harder, and sometimes just requires a different approach. He had his Kai 'Suguri' with him. He's 13 years old now, and is retired from SAR work. He's lost most of his hearing, and hasn't been training for a while. At my request, he agreed to put Suguri through some simple obedience stuff to show on my blog. It was very interesting to see the connection between them as Suguri was doing his thing off leash at the Tenrankai with over 150 Kai around! I'll get the video uploaded as soon as I can. All in all, it was a great day. Haru got tuckered out assaulting everyone and every dog with kisses, and I got to drive another 250km to get home. I was pretty impressed that I managed to get over 500km on one 35 liter tank of gas. Hurray for the Jimny. Loads of video and pictures are on the way... I guess I can work on it tomorrow. Is the dog in the first pic Riki! Looks like a perfect Autumn outing. Hey, I adopted a puppy in February and I've been trying to figure out what she is- I thought she was some sort of blue heeler/ Schipperke mix bc she's a black brindled spitzy thing, but I just discovered this breed! Is there any way I could send a picture and see what a Kai owner thinks? She's super agile and extremely smart- she's won a prize for best tricks and she does obstacle courses with ease and she's still a baby. Looks like a great pup. As far as breed goes, it's always hard to say for certain. She does seem to have some Kai-like traits.